Moving is stressful work. At PetRelocation.com, we understand this, which is why we offer superior customer service to create a stress-free experience for your pet relocation. Animals Away has been shipping animals and providing pet transport services worldwide since 1992. Animals Away was featured on Nat Geo Wild’s “We Move Animals” and proudly remains the only pet relocation company in the entire world with this distinction to date. A pet shipping service for pet relocation and for your pet transport needs. Pet shipping service offering door to door ground shipping for your pet relocation needs. Global pet travel and relocation services. Information on flying with your pet on all major airlines. 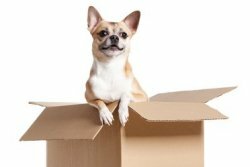 How to prepare for moving with your pet. Travel Gear for Dogs on the Move, life vests, car seats, pet stairs, bike baskets & More.